Kane Williamson won the toss and chose to bat first. The decision comes as a surprise as Ajinkya Rahane chose to bat first as well in their match against Royal Challengers Banglore which is a shift from the earlier strategy of the teams when they all were choosing to field first. 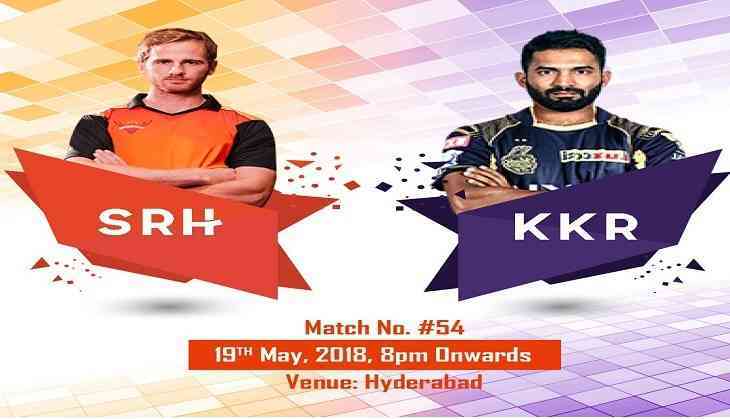 However, the SRH will be batting first and depending upon their formidable and consistent bowling line up to do the magic. SRH happen to be the table topper this season, they started their campaign with three straight and never lost that momentum actually. SRH are the first side this season to have made it to the playoffs. Whereas, the journey for KKR still bumpy. They will need to register one more win against the mightiest team this season and KKR have the credibility and bench strength to make that happen. Sunil Narine, Robin Uthappa and the biggest of all the KKR skipper Dinesh Karthik himself are the backbone of the KKR batting lineup and have not disappointed this season. The team will expect their hitman Narine to show up at the occasion and make his presence known to the fans and the opposition alike. The Sunrisers have already qualified for the playoffs and a loss tonight won't alter that but they'll want to get back to winning ways after they lost the previous match. Nothing but a win will do though for the men in black and gold from Kolkata.